When a crowd travels in a wagon, an engine must work harder in order to successfully power the load. 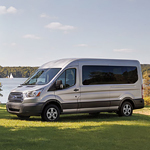 Ford Transit Wagons can handle the heaviest passengers because they have highly efficient, commercial-grade engines. The Ford Transit Wagon is designed with a 3.7-liter T-VCT V6, a 3.5-liter EcoBoost engine, or a 3.2-liter power stroke engine. All standard wagons are equipped with the 3.7-liter Ti-VCT engine. This hardware produces 275 horsepower and reasonable torque. The EcoBoost option can reach 310 horsepower and 400 lb-ft torque. Ford's power stroke hardware runs on diesel fuel; it generates 350 lb-ft torque and 185 horsepower. All of these engines can handle high hills, steep inclines, and other road conditions. Although each engine has different horsepower and torque specs, performance never suffers on the road. If you need a dependable transit vehicle for everyday objectives or important business tasks, the Ford Transit Wagon is a practical choice. You'll find this convenient automobile for sale at Tracy Ford.